Squeals of playful laughter and contagious giggles fill the air at San Diego's Hyatt Regency Mission Bay Spa and Marina, a convention style hotel where families are very welcome. Overlooking the bay, the recently re-invented, 17-story coastal hotel is a recreational haven with fun for all ages and a good value Explore Family Adventure Package available year round. The hotel has 429 redesigned guestrooms and suites (many with connecting rooms), each with elegant modern furnishings and luxury amenities including iPod docking stations, 32" flat screen TVs and high speed WiFi. Parents may be interested in the new SeaWorld themed, two-room family suites. Kids have a large room with "fishy" decor and bunk beds, while the adult bedroom has a large king. Located in the hotel's main tower, each suite has a refrigerator, 2 TVs, large dining table and kids seats, a roomy bath with granite counter, multiple phones and easy video checkout. There's even a seasonal water taxi available to maximize the theme park thrills. If the family pastime of choice is lounging by the pool, kids of all ages can swim and splash in the Hyatt's water playground with three sparkling pools, luxurious pool deck and three water slides — winners of Fodor's Choice Gold 2010 award in the "Top 10 U.S. Hotel Pools" category. It's even open at night so you can sit around a fire pit, but our family thinks winters are too cold to go in. The adjoining private marina beckons watersports lovers with aquatic activities that focus on sailing, water skiing, exhilarating jet skiing, motor boating and kayaking. There’s also daily sport fishing tours, and seasonal whale watching excursions. A family game of tennis or a bike ride along the bay are other wonderful options. The adults can work out at the 24-hour gym or relax in the Blue Marble Spa, where the full range of treatments includes facials, body scrubs, massages, manicures and pedicures with all natural and organic products derived from the environment. Red Marlin, the hotel’s signature restaurant set on Mission Bay, features California fresh, refined fare with locally sourced ingredients. You can relax in the sophisticated indoor dining room, or casual outdoor terrace with fire pits to stay warm and cozy. Kid’s menus, high chairs and boosters are all available. During the day, walk the family into the Swim Bar & Lounge which is built around a 5-foot-tall aquarium. The Hyatt Regency Mission Bay Spa and Marina (619/224-1234), neighboring San Diego SeaWorld, is located at 1441 Quivira Road, San Diego, California 92109. 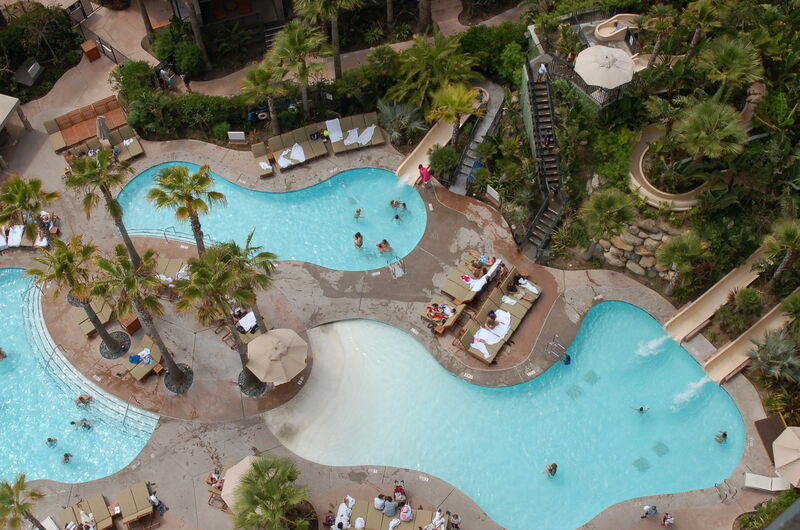 This Hyatt is offers the Explore Family Adventure Package, which offers guests 20% off the current admission rates for up to six guests at the San Diego Zoo, SeaWorld, the San Diego Wild Animal Park and Legoland in nearby Carlsbad. In case you're not sure which one of these fun places to try, check out the FTF Guide to Family Activities and Attractions in San Diego. In addition to a large double room, the Hyatt package rate includes a full breakfast daily for two adults and two children. When we priced rooms during the March 2013 spring break week, rates began at $219 per night — top value for a luxury hotel with these facilities and breakfast included. Note that the SeaWorld water taxi — it's own fun adventure — runs seasonally and is complimentary for registered children 10 and under during seasonal dates only. This promotion is valid through December 31, 2013 but is likely to be renewed annually; it must be booked in advance.